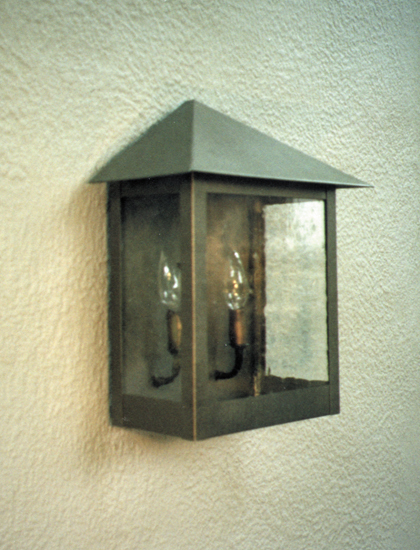 This whimsical wall sconce lighting is constructed of forged steel with a praline glass diffuser. 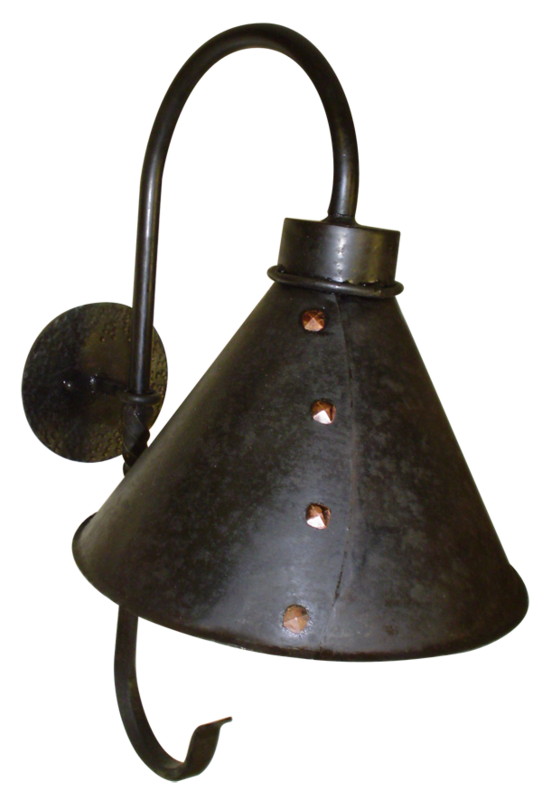 This classy rustic dark sky light fixture is the perfect design for any ski lodge or mountain home. Downward facing cone shape in hand forged steel with copper rivets. 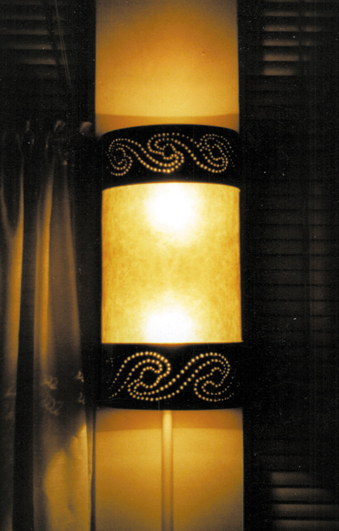 Custom lighting with rustic charm in a new vintage design. Wrought iron steel backplate and decorative twisted steel bracket with amber mica shade. 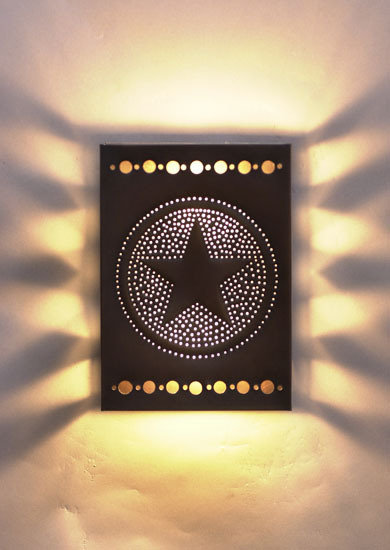 Farmhouse Star wall sconce hand punched design in copper. 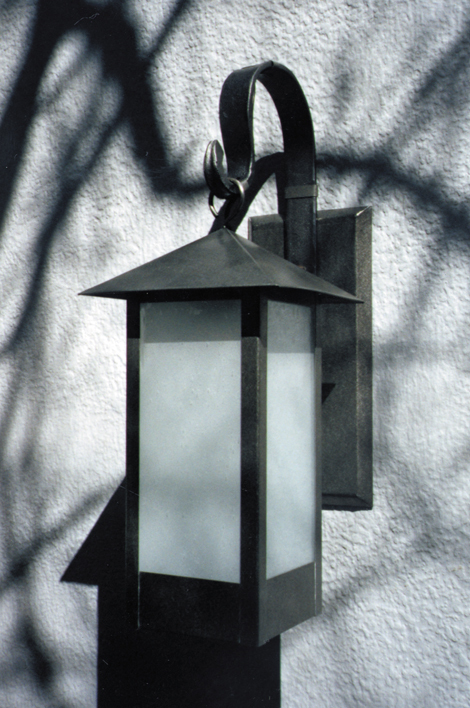 This interesting wall sconce is 20″ tall made in pewter and diffused with white water glass. 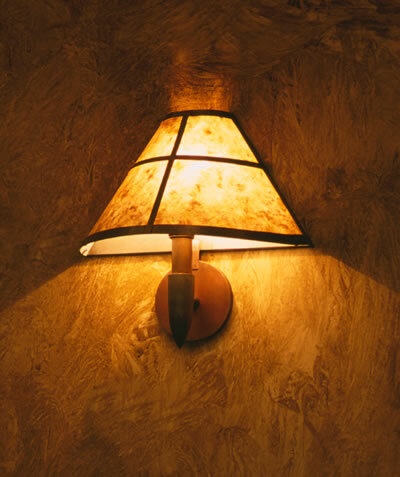 Lit by 2 A-19 incandescent bulbs this fixture can be made with compact fluorescent and UL listed for dry damp or wet locations. This contemporary wall sconce has a wide range of material and finish choices as well as endless glass and acrylic diffuser options. 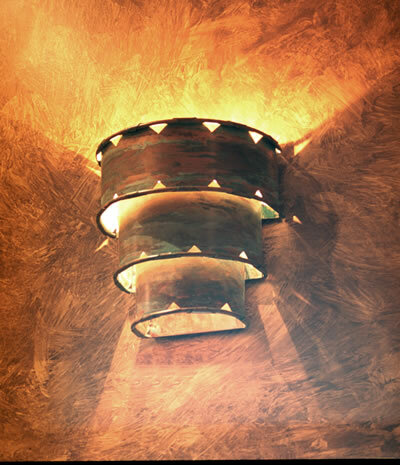 Woven copper wall sconce; UL listed for commercial or residential lighting. 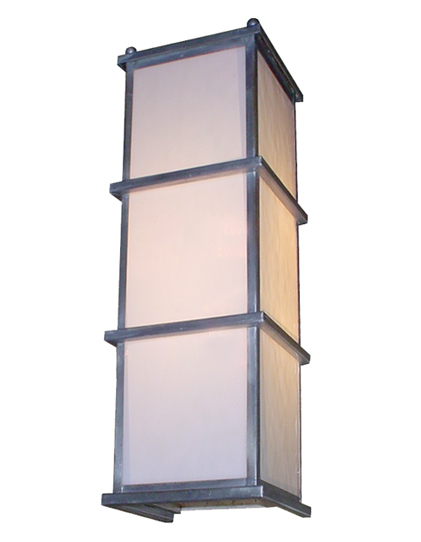 An attractive structural design and a broad area of diffuser material allow for any number of aesthetic possibilities. Dormer window details in the roof add interest to the traditional look of this handsome lantern. Gas (as shown) or electric. 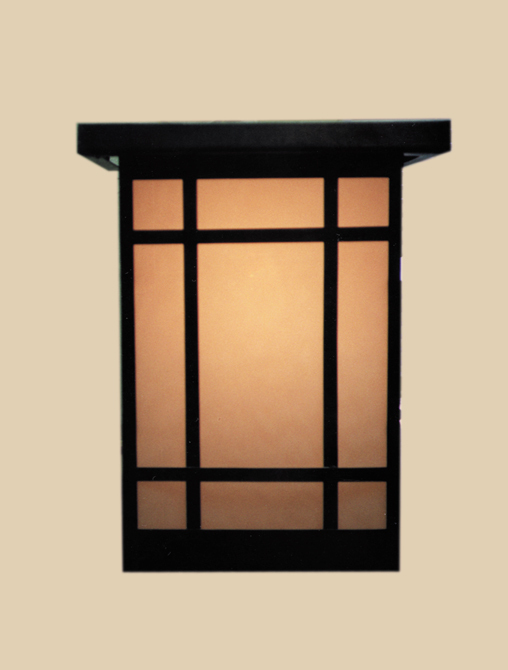 The look of a craftsman style lantern more the feel of an old-world design. 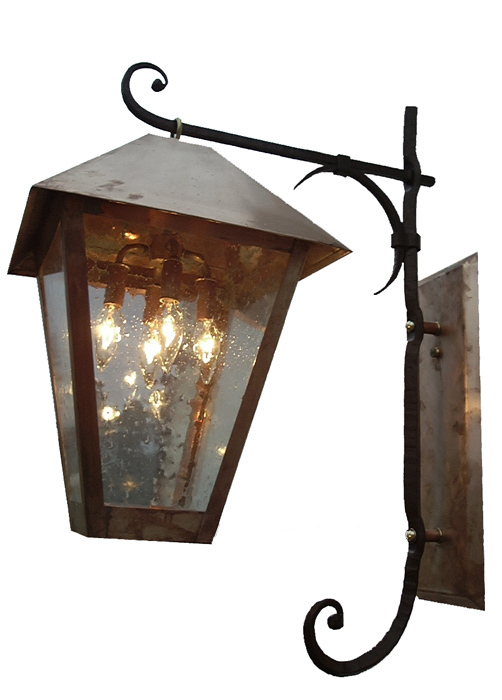 A simple lantern design with a very attractive wrought iron armature make this the perfect luminaire to compliment both simple and more ornate design schemes. 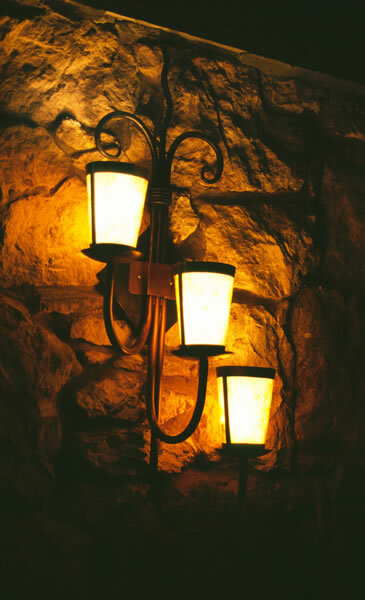 A simple change from clear glass with candelabra sockets to translucent diffuser material enables this fixture to work in more traditional settings as well as those with a more eclectic bent. 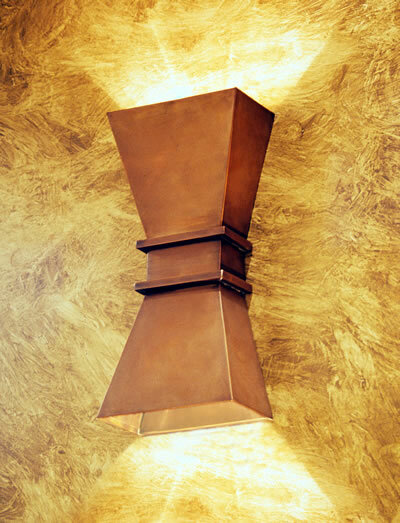 A forged copper assembly and two layers of mica with torn top edges yield this attractive sconce. 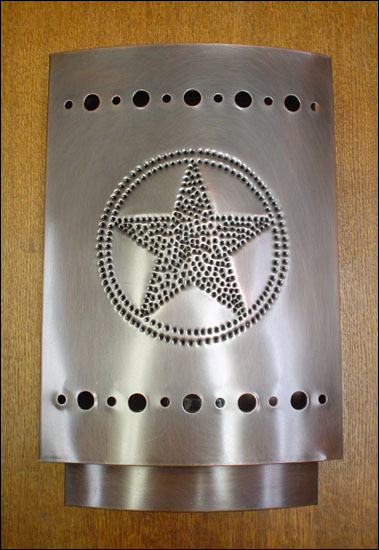 Originally designed as a right and left hand pair to surround a window, this unique wall sconce combines both fine blacksmithing and the sheet metal excellence we are known for. 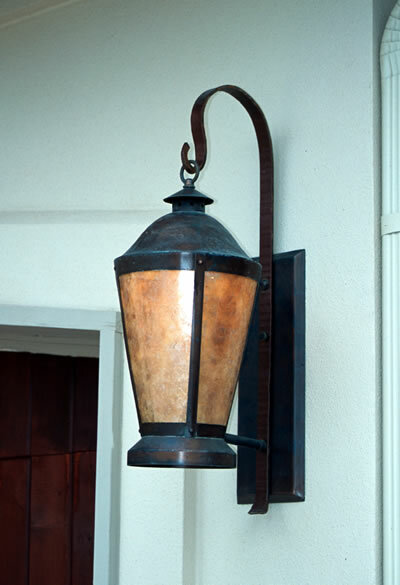 A custom finial and an unusual shade help set this otherwise craftsman style wall sconce apart from others. Shown with natural mica. 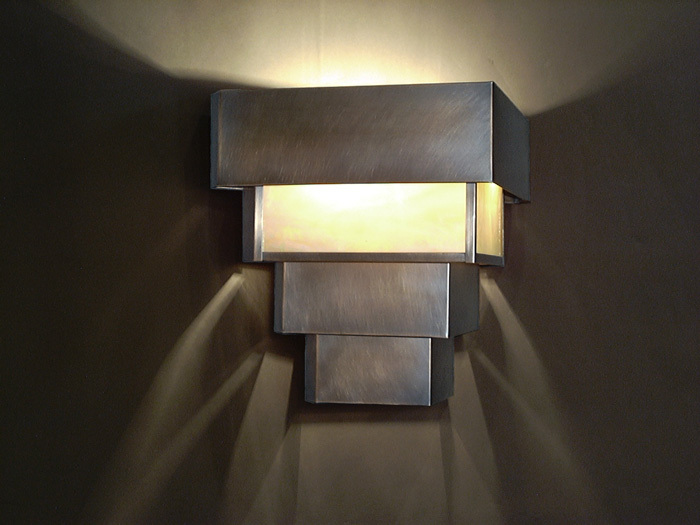 A contemporary wall sconce, this luminaire incorporates a few simple yet profound design details to achieve this well balanced, practical design. 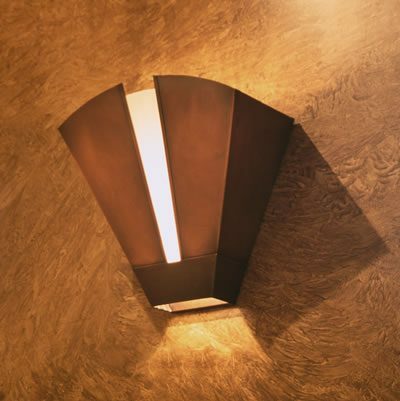 This sconce transcends architectural genres. Shown with medium darkened copper and amber mica. 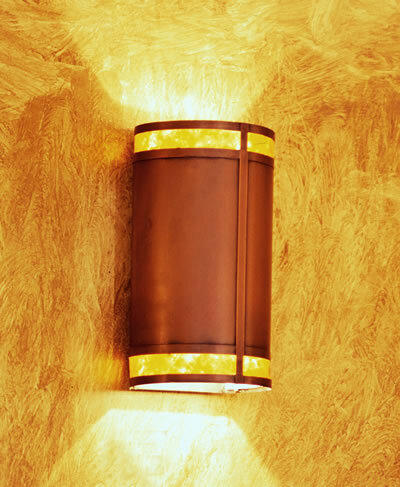 This sconce exploits the option of reversing the relationship between metal and diffuser material. 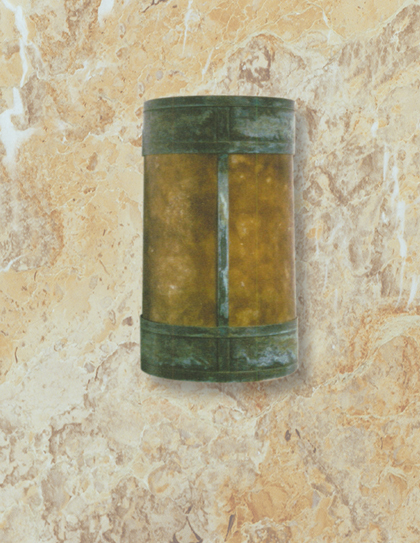 Combinations of materials are what really allow this sconce to transcend architectural genres. 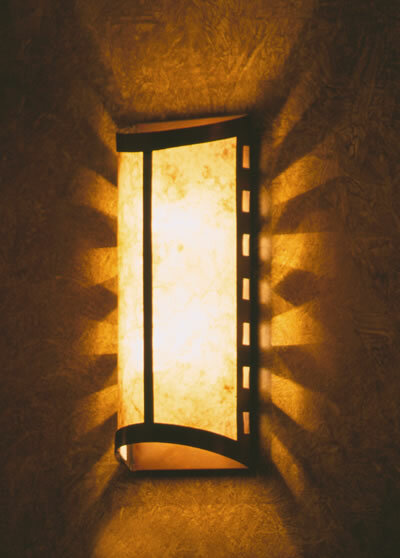 A vertical light with a strip of diffuser material in the center make this an excellent sconce for narrow spaces as well as in unison down a wall or a line of columns. 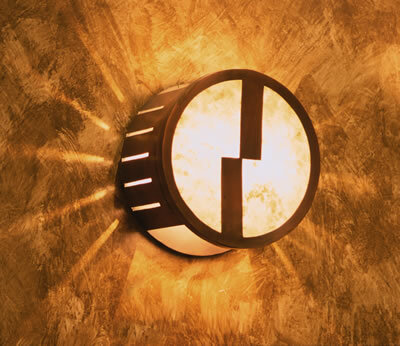 Made entirely by hand at our studio, this sconce is designed to provide an economical, yet attractive option for a commercial or residential setting. 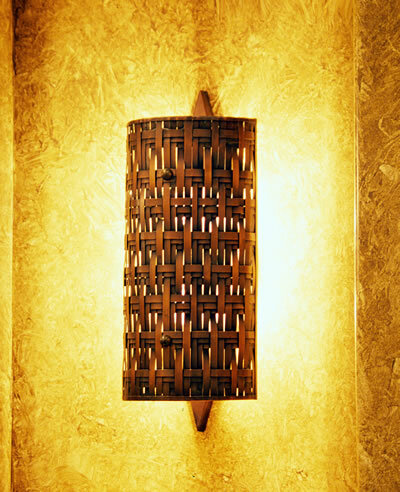 A conservative design blending well balanced proportions and lines, this sconce is perfect in any number of settings. 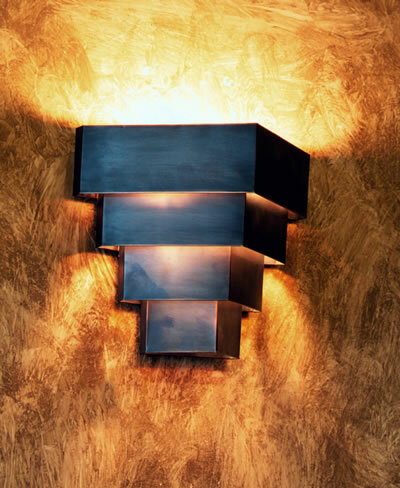 With four tiers of opaque metal, this sconce emulates the ziggurat shape. 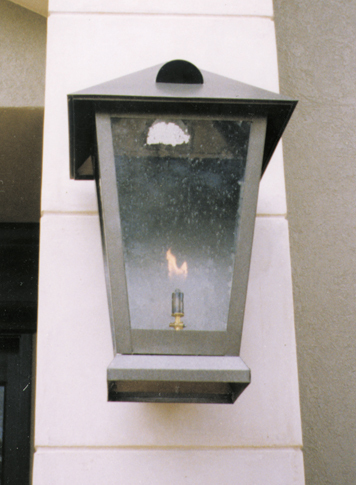 Light washes the wall above and below as well as the lower tiers of the fixture itself. This sconce provides a wash of light above and below while entertaining the eye with dramatic light shafts on either side. 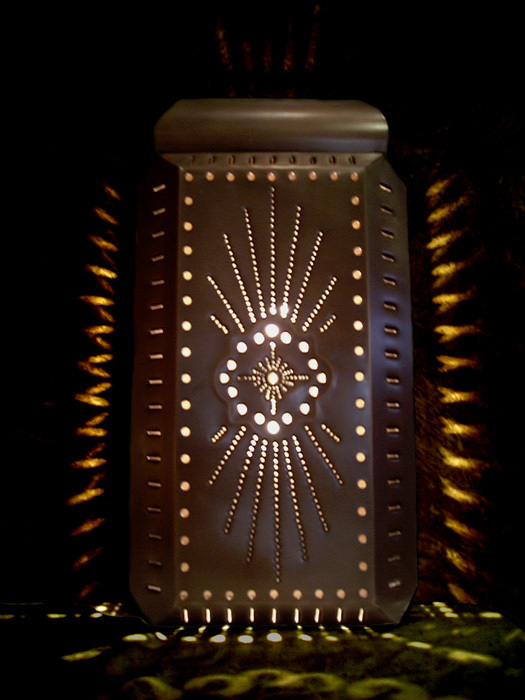 This sconce has an inverted ziggurat shape with four tiers. 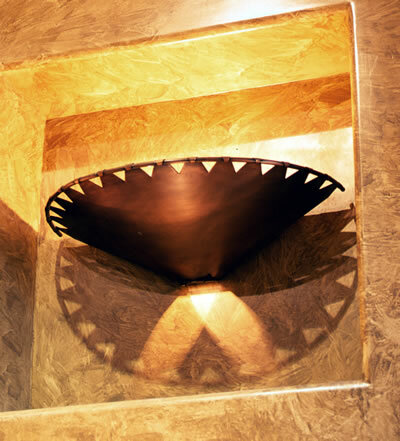 Light washes the wall above and below as well as the diffuser of the fixture itself. 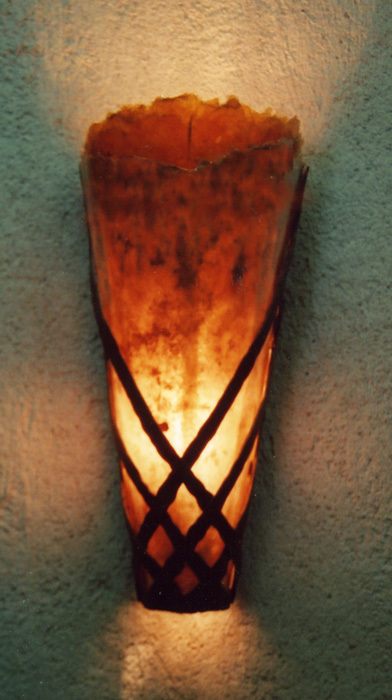 Employing an ancient Etruscan motif at top and bottom, this hand made sconce features translucent diffuser material; the look may be dramatically changed depending on choice of diffuser. Hand made in our studio. 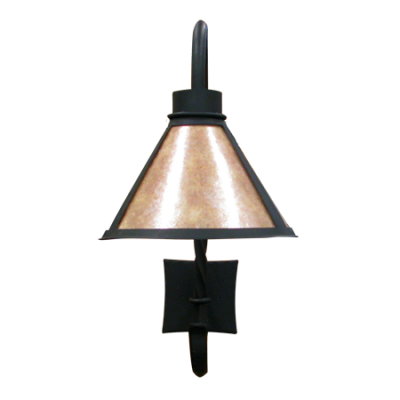 Pierced and assembled metal in a traditional pattern; shown here in a dark copper finish. A slight curve across the front plane and a bottom detail section separate this hand made sconce from the mass produced sconces flooding the market today. Three tiers of metal wrapped around formed tubing help to create this unique sconce. A hand formed bell roof and semi-traditional lantern style allows this piece to walk a fine line between traditional and contemporary aesthetics. 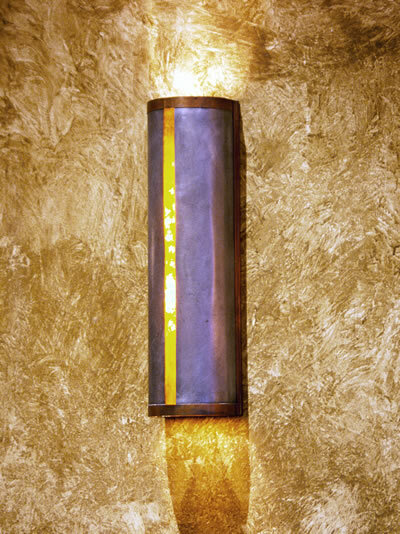 This hand made sconce washes the wall above and below with light from an abstracted hourglass shape.